You can modify the colour of a scene marker or edit the note attached to it. In the frame counter area, select the entire scene marker. 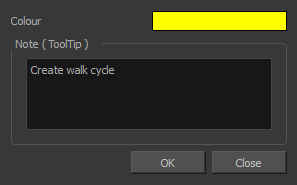 NOTE: It's important to select the entire length of the scene marker, otherwise the Timeline Scene Marker dialog box will not open for editing. Right-click and select Scene Markers > Edit Scene Marker. The Timeline Scene Marker dialog box opens.